Blondies, or you might know them as Butterscotch or Blond Brownies, are a dense and chewy bar cookie that have a wonderful butterscotch flavor. 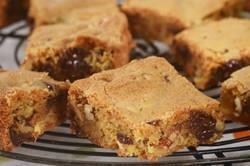 Blondies are said to be related to the Chocolate Brownie, although they do not look or taste like one. It is a little confusing as Blondies are not made with dark chocolate so the only real connection to the Brownie comes from the way they are made and their ingredients. If you think about it, the batter is more like a chocolate chip cookie batter; full of butter and brown sugar, with the added touch of toasted pecans and white chocolate chips. I really like how the pecans and white chocolate complement the Blondies' butterscotch flavor, but you may prefer to use butterscotch chips or even milk or dark chocolate chips in the place of the white chocolate chips. The reason I like to use white chocolate chips is because they are rich and creamy with a sweet yet subtle flavor. Officially White Chocolate cannot be called "chocolate" because it does not contain chocolate liquor. Good white chocolate contains cocoa butter, sugar, milk solids, vanilla, and lecithin. So make sure when buying white chocolate that it contains cocoa butter as some inferior brands use vegetable fat. This recipe is adapted from Richard Sax's wonderful book "Classic Home Desserts ". It is not often that you find a baking book that does such a good job of covering the whole gamut of baking, from 'Cobblers and Crisps' to 'Dessert Sauces'. Two delightful features of this book are the quotes from old cookbooks that are scattered throughout and the "Historical Sources" list at the back of the book. Blondies: Preheat oven to 350 degrees F (177 degrees C) and place the rack in the center of the oven. Butter, or spray with a non stick vegetable spray, an 8 x 8 inch (20 x 20 cm) square baking pan. Place the pecans on a baking sheet and bake for 8 - 10 minutes or until brown and fragrant. Remove from oven, let cool, then chop coarsely. Meanwhile, in a small saucepan, melt the butter. Remove from heat and let cool to room temperature. In the bowl of your electric mixer (or with a hand mixer), beat the egg and brown sugar until light and frothy (2-3 minutes). Beat in the vanilla extract and then the melted butter. Scrape down the sides of the bowl then, on low speed, beat in the flour mixture until incorporated. Fold in the chopped pecans and chopped white chocolate. Pour the batter into the prepared pan, smooth the top, and bake for about 25 - 30 minutes, or until the top of the brownies are dry, golden brown, and a toothpick inserted in the center comes out with a few moist crumbs. Remove from oven and place on a wire rack. Cool completely before cutting into squares. Store, covered, for two to three days. Can freeze for longer storage.